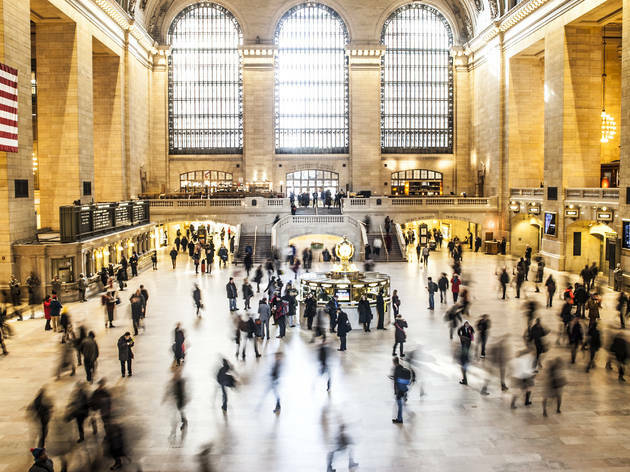 More than 750,000 people visit Grand Central a daily; some to shop, some to dine, but most to hit the rails. Beyond being a pulsating artery of New York City, the transit hub is also a spectacular work of architecture with an undeniable beauty and an incredible history. Opened in 1913, the station was designed by architecture firms Reed & Stem and Warren & Wetmore in a Beauxs-Art style and has become one of the city’s most celebrated landmarks. However, while it’s difficult not to be entranced by the station’s grandeur today, this hasn’t always been the case. 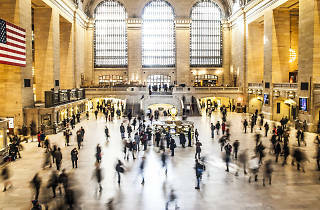 Like most of New York City landmarks, Grand Central has fallen in and out of favor over the last century, and as one might expect, it harbors some fascinating tales. From a massive screw-up in the celestial ceiling to a thwarted Nazi plan to blow the station to smithereens to the terminal’s surprising Donald Trump connection, ahead are the top 10 secrets of Grand Central Terminal. The Grand Central you see now is not the original building. Indeed, the terminal as it exists today is actually the third iteration of the structure. The original station was known as the “Grand Central Depot” and erected in 1871. The depot served the region’s three major lines, but the city’s rapidly growing population ultimately led to its demolition in 1900. Soon after, a six-story structure replaced the depot and it was renamed “Grand Central Station.” However, the design of Grand Central Station was flawed as the interior was not equipped to deal with exhaust from steam-powered trains. Conductors were often blinded by the smoke in front of them, and unable to see the tracks, several deadly accidents occurred. After 15 passengers died in one collision, the station was torn down in 1905 and rebuilt as Grand Central Terminal. When the station was constructed in 1913, planners wanted to add a top-secret power substation beneath the terminal. Known as “M42,” the equipment placed beneath ground had the capacity to transfer 11,000 volts of alternating current above to power trains. The covert move proved to be extremely advantageous when the U.S. entered WWII and needed a way to quickly move troops and artillery without impediment. However, all was nearly destroyed when a German spy who worked in the basement of Grand Central informed Adolf Hitler of the power station. As 6sqft writes, “Hitler sent Nazis over on U-Boats in the middle of the night, armed with an interesting weapon–sand. Throwing sand into the rotating blades would have wiped the converters out, along with 80 percent of troop and supply movement.” Luckily, the Coast Guard spotted the spies and the FBI nabbed them before they entered Grand Central. Among the more incredible secrets of Grand Central Terminal is the secret track hidden in its depths. It was first built to move freight but then converted into a private railroad used for ushering guests, rich and famous enough, in and out of the famed Waldorf Astoria Hotel, sight unseen. But the most famous patron of this rail for the clandestine was President Franklin D. Roosevelt who had become paraplegic (having contracted polio at age 39) and didn’t want the country to know. You can read more about the fascinating history of this rail here. Just as businesses in the city come and go, a popular spot to watch a short flick could once be found next to Track 17. The theatre opened in 1937 with 242 seats and showed short films, newsreels, documentaries and cartoons, their lengths chosen specifically for commuters. The theatre thrived for decades but was ultimately shuttered and gutted in 1967. While retails shops replaced what was there, thankfully old photos of the impressive setup still exist. Most of us are too young to remember a time when smoking inside public spaces was totally acceptable. A vestige of this nicotined past is a small dark patch in the Main Concourse ceiling next to Cancer, the crab. In 1998, the city cleaned the ceiling as part of Grand Central’s restoration project. While most would assume that the thick layers of brown and gray were accumulated train soot and exhaust, it was found that the filth was actually 70% nicotine and tar. It’s hard to believe that any modern mortal would consider demolishing something so architecturally splendid, but that was indeed the case in the early 1950s. Developers planned to knock down the terminal and replace it with what would have been the world’s tallest skyscraper. Architect I.M Pei was tasked with the design and he dreamt up an 80-story, hourglass-shaped, futuristic tower known as the Hyperboloid. Thankfully, the plans were abandoned as the costs were too high. Just outside the Grand Central Oyster Bar on the lower concourse are four arches joined by a curved ceiling that together create a whispering gallery. How it works: if one person stands at one corner and another at the opposite end and speaks at a normal volume, the other person will be able to hear everything said perfectly. And this is despite the fact that there are about 50 feet separating them.It’s not clear if the resulting acoustical effect was intentional in design or if it was happenstance. Atop the information booth at the center of the terminal is a clock that features four faces made out of one solid piece of precious opal. In total, Sotheby's and Christie's the whole thing is estimated to be worth $10-20 million. Bonus secret: Inside that same info booth is a secret steel staircase shrouded by the cylindrical brass container that leads to the lower level information booth. Follow 6sqft on Twitter and Facebook. Dan Brucker made up a lot of fake storys that are rrpeated here. The Nazis that landed were not seen by the FBI as they came ashore but were found when a few of them defected and told the FBI themselves. Also the underground power station only supplys power to the Terminal so knocking it out would in no way impede 80% of troop and supply movements. That FDR story is also fake tjay platform was there long before FDR and the car that is there is an old heavyweight baggagr car nothing more. Regarding the opal clock faces in number 10: that's false. The clock faces are opalescent glass, not opals. In fact, the largest opal ever found was only about 11 inches by 4 inches--not large enough for one face, let alone all four. The "solid opal worth $20 million" story originated with a change made by a drive-by anonymous poster at Wikipedia in 2006, with no source or citation. After diligent research which proved that the clock faces are opalescent glass, I corrected it there in February 2013, but the story continues to be posted when blog writers just copy from other erroneous sources.